We’re excited you’re interested in sharing your church’s stories of missions and ministry with us! Your Florida Baptist Convention Communication Team stands ready to come alongside you to help you tell your story effectively. You can use the following tips to guide your writing. Subject matter: The Florida Baptist Convention, a Florida Baptist church or someone currently a member of or active in a Florida Baptist church. When choosing a topic, consider what you want people to know, why it would matter to them and how the story glorifies the Lord. 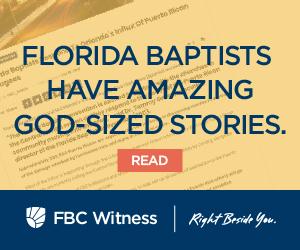 The tone and subject matter must be positive and supportive of the Southern Baptist Convention, Florida Baptist Convention, your local Association and your church. Use numbers if you have them. Use pictures to help tell the story. Photos should be 1000 pixels wide. Photos should be able to be cropped horizontally. Photos must come with a caption describing the action in the photograph or how the photo relates to the overall story. Captions should be 30 words or less. Edit for typos and grammatical errors and check your facts, specifically dates/times, numbers/money, names of people or places. Please understand that submissions or portions of submissions may or may not be used at the discretion of the Communication team. All content is subject to editing.